If you are looking for a simple recipe on how to make a vanilla layer cake which is gluten free, then you’ve come to the right place. This cake is gluten free and I’ll be honest with you, only a small percentage of my baking experience is gluten free but after a few attempts, this cake has been mastered. It’s not too different to any normal cake recipe, apart from the ingredients you use, they’ll need to be gluten free. The only different ingredients I had to buy were the flour, baking powder and sprinkles. After a few attempts at making this cake, I found that adapting my traditional vanilla cake recipe to suit gluten free had the best end result. I simply switched out the ingredients which contained gluten and swapped them with the gluten free alternatives, which are pretty easy to find in most supermarkets and specialist food stores in the UK (if you live outside the UK or can’t find them easily, a quick search on the internet will guide you in the right way). Through the various attempts I made, I found that the self raising flour that contained xanthan gum worked the best. It meant I didn’t need to add any additional xanthan gum, however I did add 1/8th baking powder but feel free to leave this out as it doesn’t make a whole lot of difference. Just make sure the flour and baking powder you use are gluten free. This cake is sweet and simple, perfect for any of your celebrations and can be enjoyed by everyone. Before we get into making the cakes, you’ll want to do some prep work. Start by weighing up all of the ingredients you need, this will save you so much time in the long run and prevent you from making mistakes with inaccurate weights. Prepare your cake tins whichever way you like and preheat your oven to 180˚c/350˚f. There is one more thing you could make at this stage that will save you time later on, the simple syrup. To make the simple syrup is really easy, place the sugar and water into a saucepan and leave over a medium-high heat until it comes to a boil, once is reaches a boil remove from the heat and allow to cool completely using it. If you’d like to flavour the simple syrup for this cake, add 1 tsp of vanilla bean paste or extract to the saucepan – this will enhance the vanilla flavour. Making the cake is straightforward, its made using the creaming method. This is where you cream the butter and sugar together for around 5-7 minutes over a medium high speed until they have become well combined and lighter in colour and consistency, scrape down the sides and bottom of your bowl then start adding your eggs, about 1 at a time beating well in-between each addition. 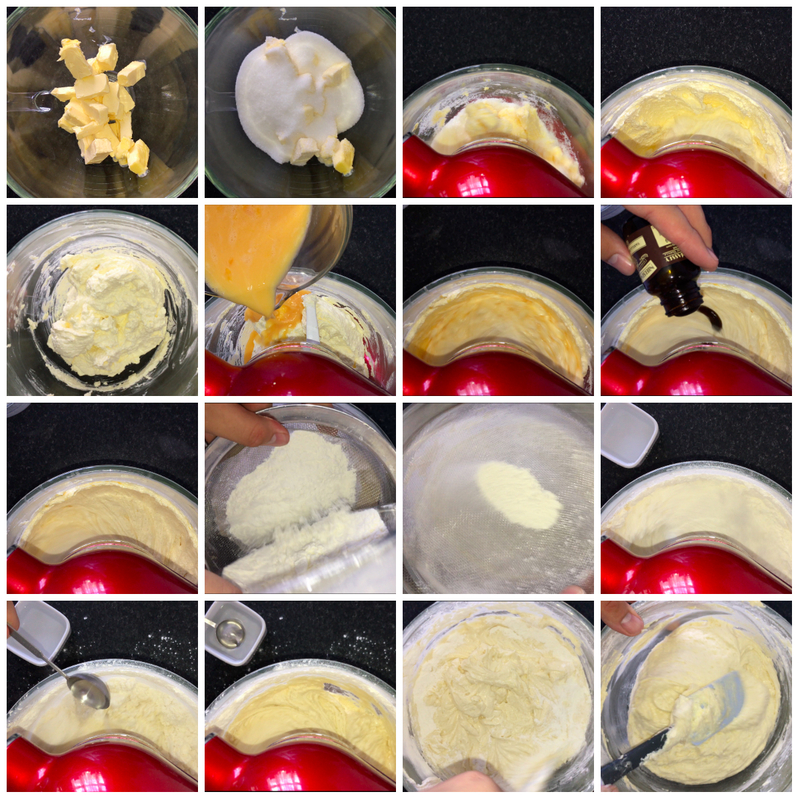 Once all of the egg is incorporated you can once again scrape down the sides and bottom of your bowl, this is just to incorporate any bits that may not have been fully worked in (If your mixture looks slightly curdled at any point, add a small amount of your flour mix to fix it). Add in your flour, baking powder and salt, passing them through a sieve first (this is just to remove any lumps or bits too big to pass through a sieve. Sieve in your dry mixture and mix over a low speed and then add in the water (or you can use milk) and mix until combined. Try not to over mix at this stage. You’ll want to split your cake batter between your 4 prepared tins, you can do this by eye or to get more accurate weight for each tin, you weigh the entire amount of cake batter using a pair of scales and then divide the amount by 4 and place that amount into each of the tins and then smooth it out as best you can using either a small cranked/offset palette knife or a spoon and then place the cake tins into your preheated oven and bake for around 25-30 minutes (or until a tester comes out clean, times vary per oven). Once fully baked, remove from the oven and allow to cool in the tin until you handle the tin, then remove from the tins and allow to cool completely on a cooling rack before you do anything else. While the cakes bake in the oven, feel free to make your buttercream. One thing to add before To make it place your butter into your mixing bowl of choice and beat it over a medium-high speed until its lighter in colour and consistency, around 7-10 minutes should do the job. Once the butter has become lighter in colour and consistency, you can add in around half of your icing sugar and mix that in, start on allow speed working up to a high speed once its incorporated. Scrape down the sides and bottom of your bowl and add in the other half of the icing sugar and repeat the mixing process until its fully incorporated, just before you scrape down the sides and bottom of your bowl again, don’t forget to add in your vanilla, I used bean paste but feel free to use extract. You can use this straight away or place into a container and place in the fridge until you intend to use it. Once your cakes are fully cooled, feel free to level them off and trim the sides (I didn’t remove the sides but its recommended to remove as much of the caramelisation as possible), I levelled all 4 of my cakes and then brushed them all with a generous amount of the simple syrup I made. I then got myself a cake stand, my cake layers, vanilla buttercream and some jam and I’m ready to start stacking my cake. So, I take my cake stand and pipe a blob of buttercream into the centre and spread it out using a small cranked or offset palette knife and place the first layer of cake onto the buttercream and press it down to secure it in place. Onto the first layer of cake I pipe a good amount of buttercream and level it using the small palette knife, then add around 1 tablespoon of jam (you can choose the flavour of jam, I went with strawberry) and place it in the centre and spread it out using the spoon and repeat these steps with the remaining layers until you have all your layers complete. Take a small amount of the buttercream and place it into a separate bowl, this is for the crumb coat. The crumb coat is a thin layer of buttercream which locks in the crumbs and prevents them from ruing your final coat. Apply a little at a time and spread it about, scraping away the excess buttercream and chill in the fridge for around 30-60 minutes or until the buttercream is firm to the touch. Once the buttercream has become firm to the touch, remove the cake from the fridge and apply your final coat of buttercream. Be generous with the amount of buttercream you use, don’t forget to do all around the cake as well as the top and to smooth it as best you can using a scraper and get it as smooth as possible. You will then want to place this in the fridge for a further 30-60 minutes or until the buttercream is firm to the touch again. Once ready, you can make your chocolate drip which is really easy and only requires 3 ingredients… Perfect right? For the chocolate drip, you’ll want to get yourself some white chocolate and chop it so its in smaller pieces and set aside (check on the back if its gluten free, if it isn’t, you should be able to find a bar in the free from aisle in the supermarket. Pour your cream into a small saucepan and place over a medium heat and bring to a boil, then pour the hot cream over your chopped white chocolate and allow to sit for around a minute. After roughly a minute stir the two together and mix until it becomes smooth, it’s at this stage that’ll you want to add any colourings in. I used the Sugarflair colour pastes as I already had these in and they are gluten free and can be used to colour chocolate, they are widely available in the UK, both online and in hobby stores. You’ll just want to add a small amount of colour to start out with, then add more if needed, just keep stirring until its fully worked in. 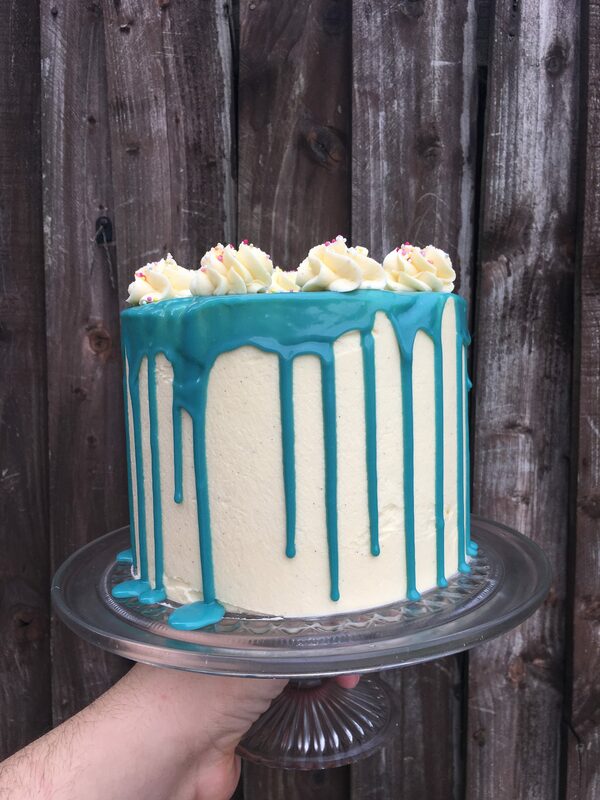 Once you’ve got your white chocolate ganache (for the drip) and your chilled cake out the fridge, you’ll want to do your drips around the edge, you can do this using one of 2 methods. Placing the chocolate into a squeeze bottle or using a spoon, either will work well, however I opted for the squeeze bottle as this is the method I prefer. Depending on your preference, you can make the drips vary in length, its all about control and personal preference. To finish, I pipe some rosettes on top of the cake and sprinkle some 100s and 1000s onto the rosettes. 2 tsp Vanilla bean paste or extract. 500g Self raising gluten free flour. 1/8th tsp Gluten free baking powder. 90ml boiling water or milk. Bake at 180˚/350˚f for 25-30 minutes (or until a tester comes out clean). 2 tsp Vanilla bean paste/extract. 100g White chocolate, chopped (check the ingredients for any gluten, you can find bars of 100g in the free from aisle). Food paste (use a brand thats suitable for using with chocolate, gluten free and concentrated). Preheat your oven to 180˚c/350˚f and measuring out all of your ingredients. Place the butter and sugar into your mixing bowl of choice and beat over a medium/high speed until lighter in colour and consistency. Scrape down the sides and bottom of the bowl to incorporate any bits that wasn’t from earlier on. Start adding your eggs in, a little at a time until they are well incorporated. Scrape down the sides and bottom of your bowl again, to incorporate any bits that didn’t quite mix in. Sift your dry ingredients into the bowl and mix over a low-medium speed until its starting to incorporate, then start adding your water or milk 1 tablespoon at a time. Repeat until all your ingredients are incorporated. Scrape down and incorporate any ingredients that haven been worked in so far. Divide the cake batter between your 4 cake tins, either by eye or weighing the total amount of batter and dividing that by 4 and having more accurate amounts in each tin. Bake in your preheated oven for 25-30 minutes or until a tester comes out clean. While your cakes bake in the oven, you can make your buttercream. Start by placing your butter into your mixing bowl of choice and allow it to beat for 7-10 minutes until its lighter in both colour and consistency. Once you’ve noticed a difference in the colour, scrape down the sides and bottom of your bowl and add in around half of your icing sugar and mix together. Starting on a low speed, working up to a high speed. Once fully combined add the other half of icing sugar into the bowl and repeat the process. Give the bowl a good scrape down and add the vanilla, giving it all a good mix. Place into a container with a lid and set in the fridge if you don’t intend on using straight away. While your cake chills in the fridge, make the ganache for the drip. Place your double cream into a saucepan and place over a medium-high heat and bring to a boil. While you wait for it to come to a boil, roughly chop the white chocolate. Pour the boiling cream over the white chocolate and allow it to sit for around 60 seconds. Then give it a good stir until its well incorporated. 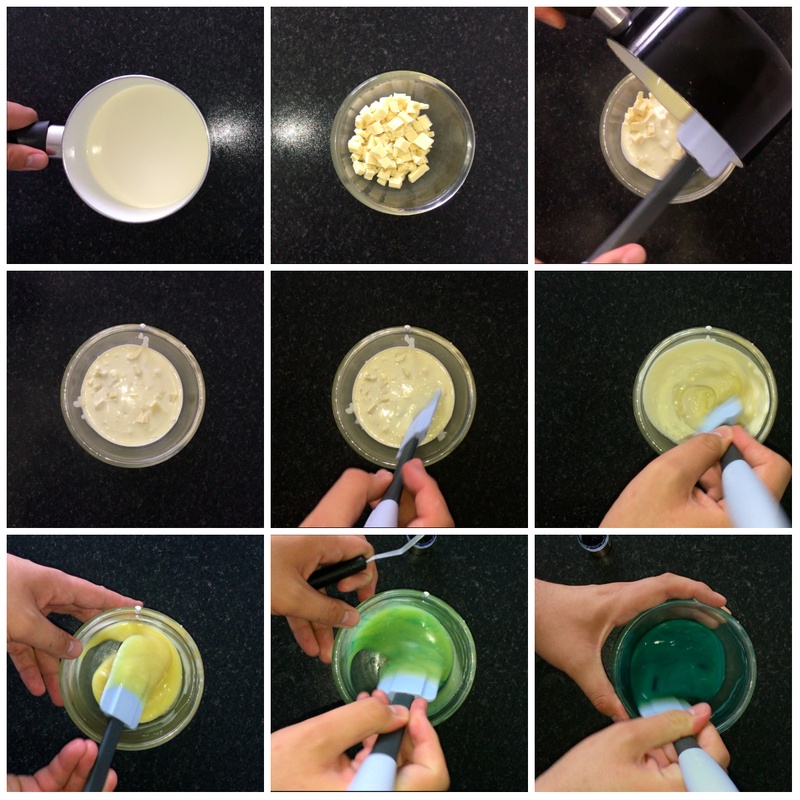 Add in a small amount of paste colouring and stir that in until its one solid colour. Get yourself a cake stand or plate and pipe a small amount of buttercream onto it, in the centre. 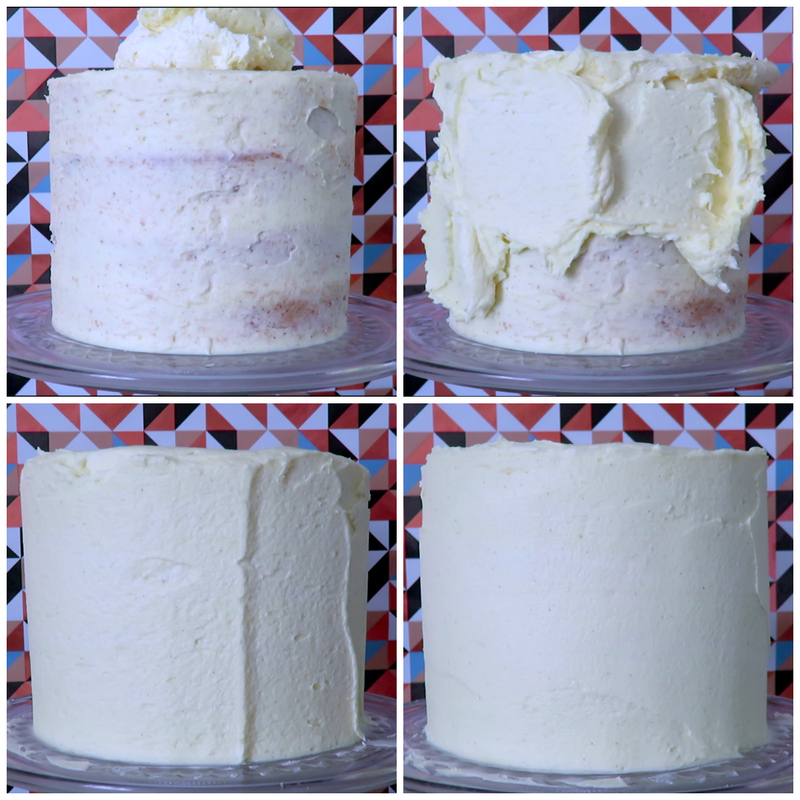 Place your first layer of cake onto the buttercream and press down to secure it in place. 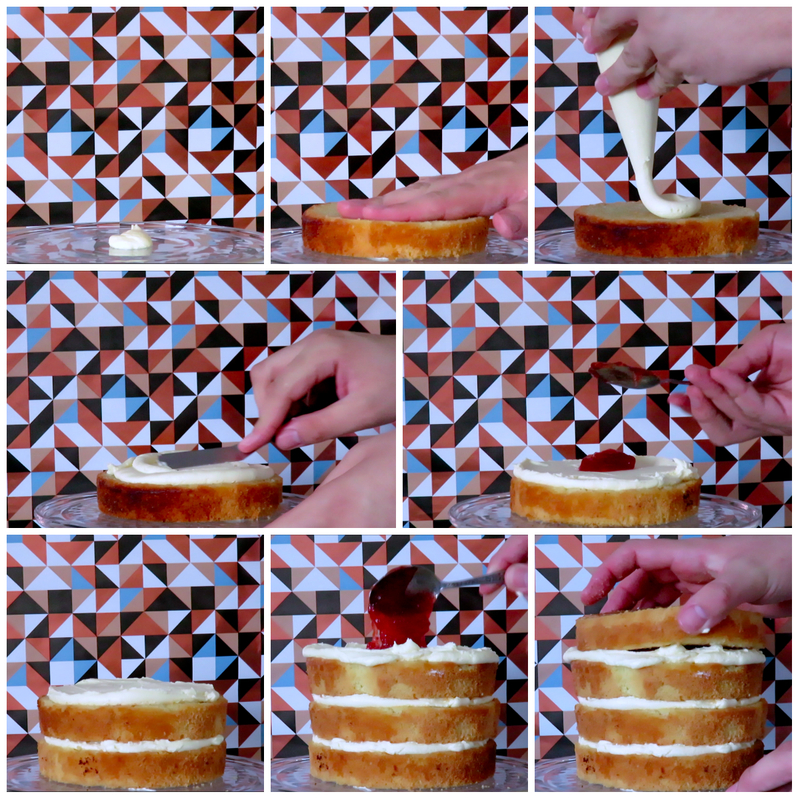 Pipe your buttercream onto the cake and spread it out so its a more consistent layer, then add a heaped tablespoon of jam and spread that out using the spoon. Repeat for the remaining layers of cake. Once your cake is stacked, you’ll want to apply a thin layer of buttercream, this is the crumb coat. This layer of buttercream will lock in all the crumbs and keep your final coat looking the best it can. Chill in the fridge for 30-60 minutes, this gives the buttercream time to firm up, ready for the final layer. Once out of the fridge, apply the final layer of icing and be generous with the amount of buttercream, as you can remove the excess when you scrape the sides to get them smoother. Once you’ve scraped down the sides and the top is sorted, place back in the fridge for a further 30-60 minutes. Just before you intend on finishing the cake, make your chocolate drip. Apple the chocolate drip, I place my chocolate ganache into a squeeze bottle (you can also do it with a spoon or palette knife and do your drips. Place in the fridge for the drips to firm up, then slice and enjoy. So that’s how I make my 4 layer, gluten free cake, which can be made and enjoyed at any celebration, especially if you’re coeliac. I really hope you get to make this, whether its for a birthday, christening or you just fancy a cake – I’m sure it will go down a treat!